Slalom skis are short, fast-’n’-furious, high-performance rippers for technical mutants and fearless athletes—and therefore, they’re ideally suited for the small-mountain, riverbank ripper or the ice-pack bump-bobbler. The blender smoothies offer precision and excitement with more sidecut than any other type of ski. Their construction provides greater torsional rigidity and a stiffer flex, allowing quicker energy transfer and the enhanced edge grip needed to win races—or just spending the day on eastern hardpack turning and turning and turning. The skis in this category grip, hold and handle with Porsche-like exhilaration. You can get a tremendous amount of edge angle and create an unprecedented vroom from each and every turn—and they make skiing gates, bumps, bulletproof ice and crazy-steep terrain just a wee bit easier. Slalom skis are typically not available in lengths longer than 170 cm and come with an ability to perform like Sparky the Wonder Dog or Daffy Duck. 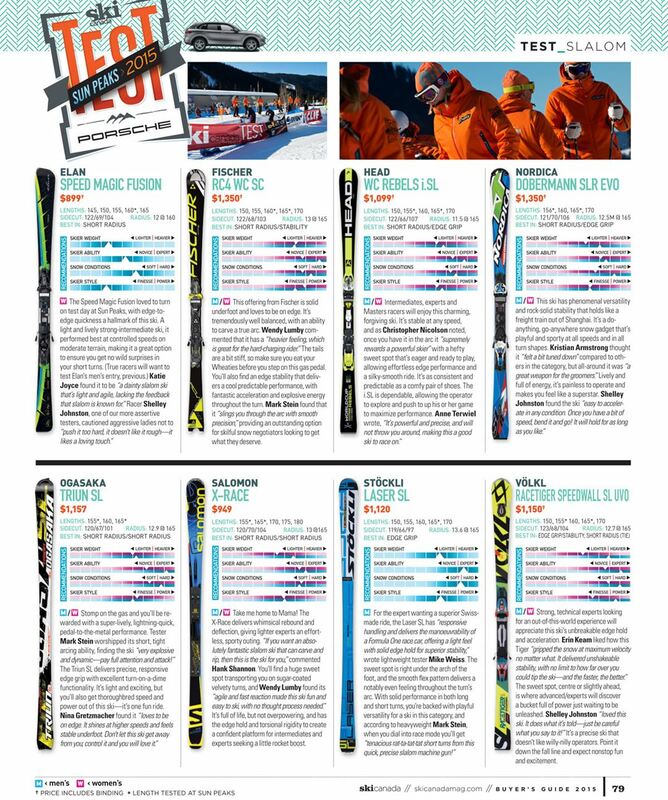 So take the time to choose the right ski for you and you will be rewarded immensely. Choose the wrong one and you’ll spend your ski day getting thrown around like a greased squirrel on roller skates. MEN & WOMEN The Redster Doubledeck 3.0 SL is a pleasant slalom ski that won’t toss you around and isn’t the slightest bit nervous at speed, but as Anne Terwiel wrote on her test card , “Don’t let the friendliness fool you. This is a wolf in sheep’s clothing; put the pedal down and it’s all-out power and aggression.” The performance-seeker who’s at home in the fall line will enjoy how easily it initiates a turn and its stability. 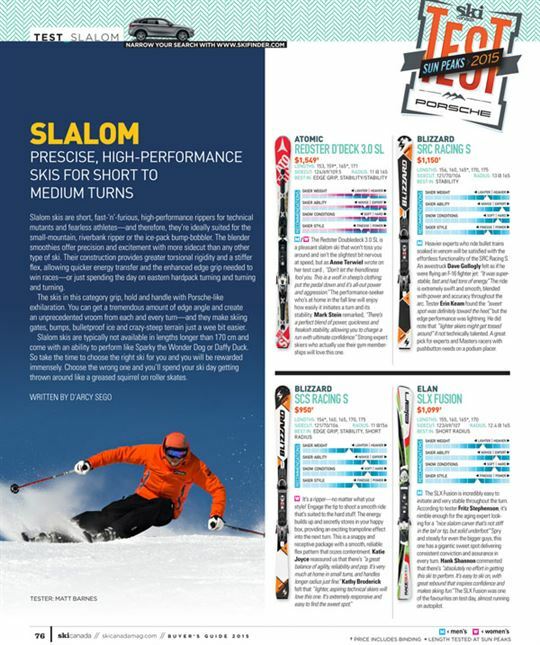 Mark Stein remarked, “There’s a perfect blend of power, quickness and freakish stability, allowing you to charge a run with ultimate confidence.” Strong expert skiers who actually use their gym memberships will love this one. MEN: Heavier experts who ride bullet trains soaked in venom will be satisfied with the effortless functionality of the SRC Racing S. An awestruck Dave Gollogly felt as if he were flying an F-16 fighter jet: “It was super-stable, fast and had tons of energy.” The ride is extremely swift and smooth, blended with power and accuracy throughout the arc. Tester Erin Keam found the “sweet spot was definitely toward the heel,” but the edge performance was lightning. He did note that “lighter skiers might get tossed around” if not technically talented. A great pick for experts and Masters racers with pushbutton needs on a podium placer. MEN: The SLX Fusion is incredibly easy to initiate and very stable throughout the turn. According to tester Fritz Stephenson, it’s nimble enough for the aging expert looking for a “nice slalom carver that’s not stiff in the tail or tip, but solid underfoot.” Spry and steady for even the bigger guys, this one has a gigantic sweet spot delivering consistent conviction and assurance in every turn. Hank Shannon commented that there’s “absolutely no effort in getting this ski to perform. It’s easy to ski on, with great rebound that inspires confidence and makes skiing fun.” The SLX Fusion was one of the favourites on test day, almost running on autopilot. MEN & WOMEN This offering from Fischer is solid underfoot and loves to be on edge. It’s tremendously well balanced, with an ability to carve a true arc. Wendy Lumby commented that it has a “heavier feeling, which is great for the hard-charging rider.” The tails are a bit stiff, so make sure you eat your Wheaties before you step on this gas pedal. You’ll also find an edge stability that delivers a cool predictable performance, with fantastic acceleration and explosive energy throughout the turn. Mark Stein found that it “slings you through the arc with smooth precision,” providing an outstanding option for skilful snow negotiators looking to get what they deserve. MEN & WOMEN Take me home to Mama! The X-Race delivers whimsical rebound and deflection, giving lighter experts an effortless, sporty outing. “If you want an absolutely fantastic slalom ski that can carve and rip, then this is the ski for you,” commented Hank Shannon. You’ll find a huge sweet spot transporting you on sugar-coated velvety turns, and Wendy Lumby found its “agile and fast reaction made this ski fun and easy to ski, with no thought process needed.” It’s full of life, but not overpowering, and has the edge hold and torsional rigidity to create a confident platform for intermediates and experts seeking a little rocket boost. MEN & WOMEN Strong, technical experts looking for an out-of-this-world experience will appreciate this ski’s unbreakable edge hold and acceleration. Erin Keam liked how this Tiger “gripped the snow at maximum velocity no matter what. It delivered unshakeable stability, with no limit to how far over you could tip the ski—and the faster, the better.” The sweet spot, centre or slightly ahead, is where advanced/experts will discover a bucket full of power just waiting to be unleashed. Shelley Johnston“loved this ski. It does what it’s told—just be careful what you say to it!” It’s a precise ski that doesn’t like willy-nilly operators. Point it down the fall line and expect nonstop fun and excitement.